Notes: The South Wales Railway was the first to reach Carmarthen. The railway was built to ship coal from the South Wales valleys to London, and secondly to complete Brunel's vision of linking London with New York; additionally the scheme would be financially rewarding immediately to the south Wales coal industry and to operators of ferries to Ireland. The initial part of the line between Chepstow and Swansea was opened on 18 June 1850, with trains operated by the Great Western Railway under a lease agreement. At the eastern end of the line the connection to Gloucester and London was completed in July 1852 when the bridge at Chepstow was finished. Once trains had reached Swansea the next goal was Carmarthen. Construction of the line west of Swansea was delayed, due to the financial problems of the late 1840s, and the abandonment of construction of the Irish railways that would have connected with the Fishguard ferries at Waterford. The western terminus of the line was changed from Fishguard to New Milford (Neyland). The company had hoped to build their Carmarthen station at John's Town on the west side of the town but this would have required a bridge over the River Towy which would delay completion of the line. Instead, the company opted for a temporary station at Myrtle Hill to the south of the town, and construction started there with the arrival of a shipment of timber in May 1852. Although the station was unfinished, with only one track laid, the festive official opening took place on 17 September 1852. The Bronwydd band led a procession from the town to Myrtle Hill to greet the first train which left Swansea at noon and stopped at all stations for speeches; by the time it reached Carmarthern it was running 1½ hours late. The engine driver was Daniel Gooch, the GWR's 'Superintendent of Locomotive Engines' who, in later life, became chairman of the Great Western. The waiting crowd was disappointed that their long-promised station had not been completed, although a contemporary engraving published in Illustrated London News (reproduced below) showed a completed station with two platforms, two lines and an overall roof (trainshed). The station had two facing platforms, with a forecourt and the main station building on the down side and waiting rooms on the up side. A signal box was sited on the down platform immediately to the south of the station building. This controlled access to the goods yard which, by the 1880s, had six sidings to the north of the station on the down side. 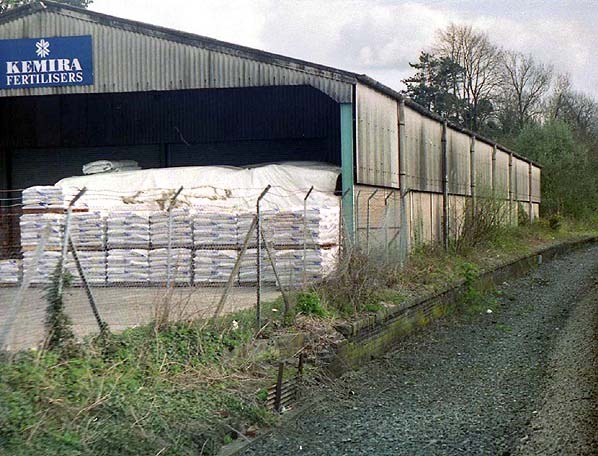 The yard had a large brick goods shed and a 2-ton crane, cattle dock and pens. The band of the 48th Regiment (a company of the same Regiment was stationed at Carmarthen) travelled on the train and then led the procession back to town where there was a grand feast. After the official opening, public services began on 11 October 1852 with the first train leaving Carmarthen at 6.30 a.m. As this was before the arrival of the first train from Swansea an engine had to be shedded at the station overnight. To accommodate this, a wooden engine shed was provided to the south of the station close to the River Towy; this was built c. April 1852 during the construction of the line. The engine shed was short-lived and was blown down during a severe storm four months later. A replacement brick-built three-road shed was constructed by a local contractor. The shed was sited to the north of the station on the up side, opposite the goods yard, and was ready for use by the time the station opened. Goods services to Carmarthen initially consisted of a 7.15 am departure for Paddington and a down goods for Carmarthen that left Chepstow at 6.30 am. Although often referred to locally as Myrtle Hill the station was always officially called Carmarthen. In December 1852 another severe gale stripped the roof off the timber carriage shed. The station quickly proved popular, with excursions operated both from and to the town, and many local people took their first opportunity to spend a day at the seaside. As well as local excursions some went further afield, including an excursion to London in 1853 to see the 'Grand Military Spectacle' at Cobham. This excursion left Carmarthen at 6.00 a.m. and arrived in London at 4.30 p.m. It returned a week later. One incoming excursion brought a party of two thousand teetotallers from Aberdare. Despite the popularity of the new service there were numerous complaints about the inconvenient siting of the station to the south of the town. These came largely from the town’s tradesmen who had the added expense of transporting goods from the station to the town; the road was soon very busy with horse-drawn traffic. For the convenience of passengers, two local inns provided a horse-drawn bus service to meet each train. To cater for the high demand the owner of the Ivy Bush Inn transferred his stable of seventy horses from Swansea to Carmarthen. The second line to Carmarthen was finally completed on 11 February 1853, and the company was keen for construction to proceed quickly westwards; this required a bridge over the River Towy. The Carmarthen town council was insistent that this bridge should not impede river navigation. To avoid this Brunel designed a two-span drawbridge, one end of which could be lifted hydraulically before being rolled back onto the rails. 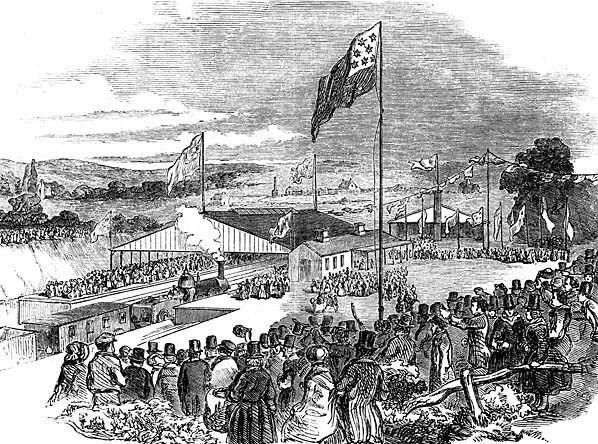 The next stage of the construction took the line to Haverfordwest, with the official opening of the single-track extension taking place on 17 December 1853. Public services ran from 2 January 1854 when Carmarthen ceased to be a terminus. A railway finally reached the centre of Carmarthen in 1860. The Carmarthen & Cardigan Railway opened the first mile of their line on 1 March 1860 from a junction with the SWR north of Carmarthen station to a temporary terminus in the centre of the town. On 1 July 1860 the SWR station was renamed Carmarthen Junction; at one time the station was also known as Carmarthen Junction Road. A second signal box was sited at the actual junction. The engine shed closed on 11 February 1907 and was demolished in August 1909. 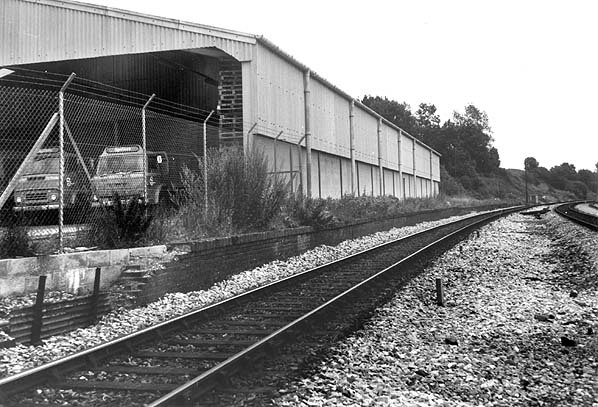 Its replacement was a standard Churchward six-road building with a large workshop which opened on 11 February 1907 close to the third Carmarthen station, near the town centre. Carmarthen Junction station closed on 27 September 1926, but remained open until 7 June 1965 as one of two goods stations serving the town. Crowds gather for the 'official opening' of Carmarthen station on 17 September 1852. Although the station was unfinished, with only one track, this contemporary engraving from the’ Illustrated London News’ shows a completed station with two tracks. Public services were introduced on 11 October 1852. 1889 1:2,500 OS map. New House is the station master's house. It is now called St. Peter's House. 1906 1:2,500 OS map. There is little difference between the two maps apart from the goods shed which is now smaller. The station had an extensive goods yard, with one siding passing through the goods shed and another looping round it. To the east of the goods shed two sidings serve a loading dock with an adjacent weighbridge and crane. A longer parallel siding runs on to the cattle dock and pens. 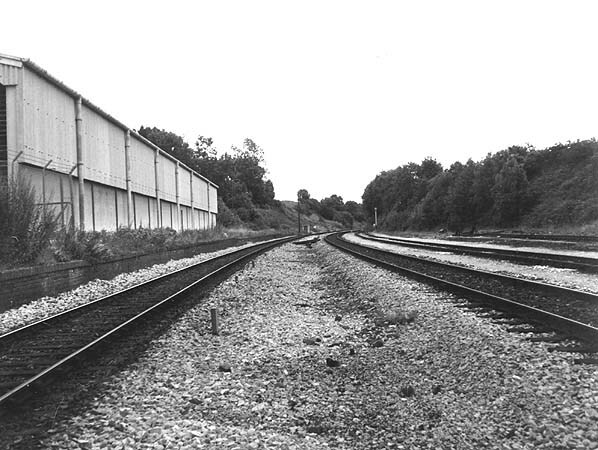 On the opposite side of the line the three-road engine shed and sidings are seen; a water tank and turntable are also provided. 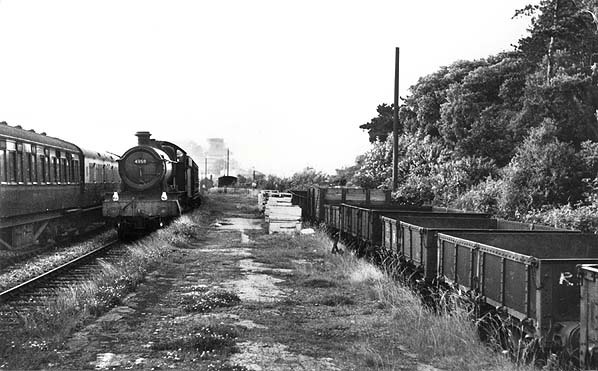 Looking north from Carmarthen Junction goods yard in July 1948. The station is behind the photographer. Carrying class A headlamps, for an express working, is 4958, 'Priory Hall'. Built in September 1929 to a design by CB Collett at Swindon Works for the GWR, it had a service life of 35 years when it was withdrawn from 85B, Gloucester Horton Road shed in September 1964 and cut up at Cashmores of Newport in January 1965. When this picture was taken, it was shedded at 87G, Carmarthen until moving in November 1958 to 86G, Pontypool Road, and then to Gloucester in July 1964. The Halls and modified Halls were the ‘maids of all work’ for the GWR, the equivalent of the LMS Black Five and the LNER B1, many lasting until the end of steam on the GWR. Eleven locos have been preserved, many being rescued from Woodham's scapyard in Barry. Carmarthen Junction station down platform looking south in April 1995. 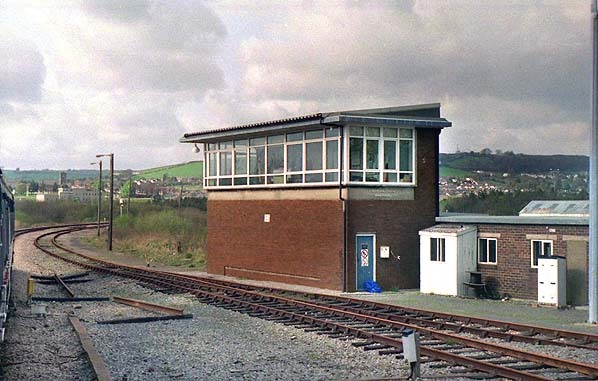 Carmarthen Junction signal box in April 1995. 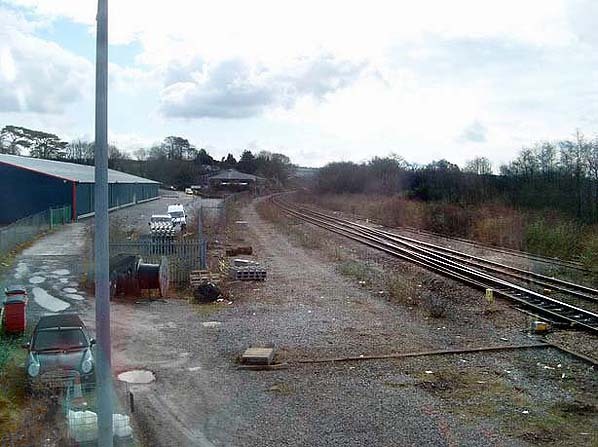 Looking south towards the site of Carmarthen Junction station from Carmarthen Junction signal box in March 2009. The warehouse on the left is on the site of the goods yard. The warehouse in the distance is standing on the down platform. The engine shed was to the right. 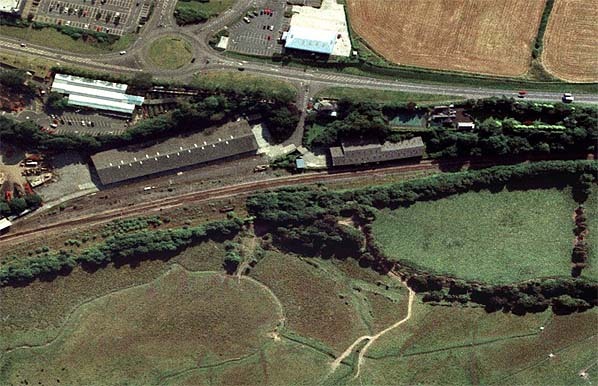 Aerial view showing the site of Carmarthen Junction station and goods yard.